With more than 50 million implants in cataract surgeries worldwide, the AcrySof® family of lenses are the most frequently used intraocular lenses (IOLs) in the world, largely because physicians appreciate the long-term clinical results and unmatched stability. Founded in 1979 by Patrick Verb, M.D., the Grosse Pointe Eye Center has dedicated itself to patient oriented care and service. For over 30 years, Dr. Verb has devoted his practice to caring for patients and their visual needs. We specialize in comprehensive eye care offering state of the art diagnostic equipment for detection and management of cataracts, glaucoma, macular degeneration, and a wide range of other eye diseases. Don't let Cataracts Limit Your Vision.... Or Your Life! As we age, our vision declines, especially in low light situations. Cataracts make this problem worse by causing a clouding of the eye's normally clear, crystalline lens. Symptoms are blurred vision, glare at night, and a need for stronger prescription glasses. Over time, cataracts progress and the vision declines further without treatment. You will only have cataract surgery once! Understand your options. Luminous Chemical Peels -Our Luminous Chemical Peel with it's advanced GLX technology helps improve your overall skin clarity and smoothness. It's specifically designed to help reduce the appearance of fine lines and wrinkles. It removes facial blemishes and promotes improved skin texture and pigmentation for a newly rejuvenated look. 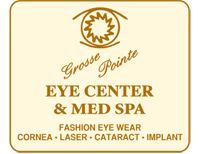 The opticians at the Grosse Pointe Eye Center are ready to assist you with your vision correction needs. We carry a wide selection of designer frames and offer many choices of new high definition lenses.